Bursa and Cumalikizik: The Birth of the Ottoman Empire comprises the empire's first capital and its emerging functions. The reign of the Ottomans started here in 1326, with the surrender of Bursa to Osman Bey by the Byzantines. His son Orhan Ghazi is seen as the founder of the Ottoman dynasty. The tombs of both father and son are located in Bursa. This is a serial nomination of 8 components: 7 in Bursa, plus Cumalikizik. Cumalikizik is a town 8km east of Bursa, representing an Ottoman village with rural land schemes. The monuments in Bursa include 4 kulliye complexes, which combine religious and social functions such as mosques, madrasah, public kitchens and public baths. Together with Meteora, Bursa was the WHS I most looked forward to on my recent 2.5 week long trip through Bulgaria, Turkey and Greece. And it certainly did not disappoint. I spent 2 nights in this city that has a very positive vibe; I actually walked all over the place for a day and a half as its WH locations are so scattered. It also has an impressive live call to prayer from the ‘competing’ mosques to wake up with ánd there are great food stalls. My hotel in Bursa was just inside the Citadel, the ancient part of the city where the Byzantines had their center. When the Ottomans conquered the city in 1339 and set up a new civil and religious center, they did so away from these old city walls. From the Citadel though you have a good view of the Grand Mosque with its 20 domes and 2 minarets. That Grand Mosque was also my first goal in the city. It was crowded with domestic visitors – both tourists and worshippers. This mosque has a very special layout: in the center, under a kind of atrium covered with a glass dome, is a large fountain for ablutions. Around it there are niches to which believers can withdraw. Most striking feature of this mosque though are the large texts on its walls - 192 prayers and slogans have been done in calligraphy by 41 artists. 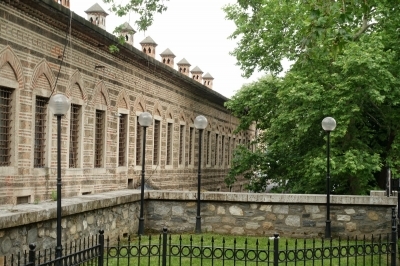 The mosque is part of the Orhan Ghazi Kulliye, a complex that included a religious school, community kitchen, bathhouse and commercial buildings. These last buildings have now been transformed into a bazaar - especially the former silk fair is an attractive building. Here, too, it is crowded with people enjoying the terraces for food and drinks. The next morning I went to one of the other locations: the Yesil (Mehmed I) Kulliye. It lies on the other side of the river, a half an hour walk. This complex also consists of a number of buildings that belong together. The most important are the Green Mosque and the Green Tomb. The Tomb includes the mausoleum of Mehmed I, the 5th Ottoman sultan. It is not green, but blue with turquoise - very beautiful. Opposite the Tomb is the Green Mosque. This has some green tiles on its interior. It was built in a totally different style than the Grand Mosque where I went yesterday. It feels more intimate, almost Persian with the many tiles and the gold-with-blue elaborate muqarnas. Towards the end of the morning I prepared for the trip to a third location: the village of Cumalikizik. It should be possible to get there on bus 22, but I could not find its departure point. The public transport app on my phone showed that you can also get there by metro, so I went for that option. The Bursa metro looks very new and is as efficient as you would expect from a metro. In about 20 minutes I arrived at the station of Cumalikizik. The village however is still half an hour walk away. Fortunately, all minibuses are passing by with that destination, so for 30 cents I got dropped off at the central square. Cumalikizik is a farming village that stems from the same early beginnings of the Ottoman Empire as the monuments in Bursa. This village, together with many others that no longer exist in their original state, provided food to the city and its new rulers. It turned out to be super crowded in its narrow streets. Even a bus with Chinese tourists had managed to find the village. The only thing you can really do here is walk up one road, covered with treacherous uneven stones, and another one back again. The colourful, sometimes dilapidated houses are photogenic though. A day or so after my visit I read a Turkish news article in which an official proclaimed that “Turkey has not enough WHS”. I was a bit sceptical about this act of patriotism at first – but looking at the ratings of the Turkish WHS on this website, I noticed that they have only 2 sites on 3 stars and nothing lower than that. At 3.5, Bursa ranks the 4th lowest among the 18 WHS. But it is a lovely off-the-beaten track destination to visit. So yes, there is room for more Turkish WHS! As a daytrip from Istanbul I made my way to Bursa. Bursa embedded in a lush green valley is a nice distraction from the tourist filled streets of Istanbul. It is also a more concise and homogeneous site as it focuses exclusively on the Osmanic heritage. Most notable to me where the Green Mosque and associated Mausoleum and the Khans (trading posts) found in the city center. I would concur with Paul that Bursa is a worthwhile addition to the list and that the ICOMOS deferral due to paperwork issues seems unwarranted. All the while admitting that the site most certainly does not meet five criteria for inscription. In addition to Ian in his review, my Turkish barber back home also told me to get Iskender Kebab in Bursa. I am not quite sure, though, if I picked the proper place as there were two Iskender restaurants just next to each other and I had to pick one. In addition there are even more "original" Iskender restaurants across town. It does seem they all belong to the same parent company, but who knows? As laid out by Ian Bursa is an easy and nice day trip from Istanbul. There are two ferry operators connecting Istanbul to Mudanya (Bursa): BUDO and IDO. I went with IDO as both Ian and another source I studied online recommended them. The IDO terminal was also within walking distance (25min) from my hotel. As a general recommendation I would check each operator's point of embarkment and pick the closest one. BUDO seems to be the better option if you are staying more in the direction of Eminönü/Taksim. Schedules are available online. Buying a ticket can be done online, but I just went to the terminal and bought it there. From Mudanya there are both regular (yellow) line busses as well as private shared taxis. The busses do not take you to downtown Bursa but the most outward metro station, Emek. From there you have to switch yet again and take the metro to downtown. For the line busses and metro you need to buy a Bursapass. For the IDO terminal these are sold in the cafe just next to the bus station. Buy at least two rides so you have both the line bus and the metro ride covered. To return to the ferry terminal go back to Emek and exit on the other side from where you entered. There is a bus station with both line busses and shared cabs regularly stopping. The bus end stop shown on the bus will be the ferry terminal (BUDO or IDO). Pick accordingly. I waited less than 10min for a shared cab to take me to IDO. Personally, I found the shared cab more comfortable as you get a seat unlike the line bus where I had to stand for the whole trip. Taking the time it took me to get to the port, waiting for busses and ferries, I think a one way trip is around 3-3.5h. Last remark: If you are considering to go by bus, don't. Istanbul traffic is hellish and this will just be a waste of time and energy. Bursa became a very enjoyable but late addition to our long weekend in Istanbul, fortunately for us it had already been well covered by other reviewers, so we knew what to focus on in the city centre, especially thanks to Solivagant’s explanation of “Kullieye”, so I won’t expand much on their thorough rundowns. We enjoyed walking around the central market area, and the central mosque was very welcoming and the trickling of the fountain under the glass dome inside gave a very tranquil feeling. Opposite it the Silk Khan showed some of the commercial heritage of the city. The real highlight was the Yesil (Green) complex, the interior of the Green Mosque was very impressive. The deep blue tiles and muqarnas (honeycomb vaulting) gave the impression of a Persian interior, rather different to the Byzantine inspired mosques we had visited in Istanbul. Walking the short distance from the centre out to the Yesil complex we passed over a stream flowing down from the surrounding lush mountains and I understood why Bursa has such a strong pleasant reputation, even the air felt soft and comforting. Now I have to admit there was another reason why I came to Bursa, not only was it to explore the ottoman heritage, and get another tick off the list, it was also a pilgrimage to the birthplace of one of my favourite meals, the İskender kebap. It has long been a favourite dish thanks to my residency in the heart of Turkish London, so I jumped at the chance to try it from the original restaurant, a short stroll from the Town Hall. A long winding queue on a Sunday lunchtime suggested we found the right place, and it was rather fun joining the swift moving line, looking a little confused when the locals asked u some questions and then being presented with the shortest menu I have ever seen [-]Half portion, Full portion, Double portion[-]. If like us you are travelling form Istanbul it is possible to do it as a day trip: The ferries run regularly and take about 1hr 35mins – 2hrs. From the ferry port you can get a bus or dolmus to the final metro stop at Emek, and then ride the metro all the way to Şehreküstü which is just a short signposted walk from the central mosque. The trip in from the ferry port is actually rather lengthy so the whole trip from Istanbul to the city centre will probably be about 3 hours. There are two ferry companies that run on the route, we had no problem turning up and buying tickets for the next sailing with IDO, however there were none available when we tried the same with BUDO, so it may be worth buying your ferry tickets in advance. And a note of caution they go from different ports at the Bursa end which are about a 15 minute taxi ride away from each other so make sure you go to the correct one. All in all it was a nice trip to Bursa and we felt like we had a better appreciation of Turkey’s diverse charms even if it was only as a day trip from Istanbul. The two things not to miss are the Green Mosque and the Iskender kebaps! In 2014 ICOMOS requested that Turkey should “Revise the focus of the nomination” for Bursa, didn’t accept any of the 5 proposed criteria and recommended “deferral”. Facing a stroppy WHC, it was overruled and Bursa became the 8th site converted by the WHC that year from a “Deferral” recommendation to an “Inscription” – and on all the original nominated criteria! We were particularly interested to see what we would make of it all and had an afternoon/evening in which to do so! Bursa city has a very positive reputation among Turks as a place to live. Known as “Green Bursa” it is set in a fertile valley and also has easy access to ski slopes and the sea. It is the fourth biggest city in Turkey with a population of around 1.8 million and is booming. It was perhaps unfortunate that it was the first WHS of our trip and we were still getting used to the car, the traffic and the culture/history of Turkey. Apart from a 3hr drive (!) across Istanbul the previous evening it was also the first major city we reached. I hadn’t yet got my “Sygic” map app working and also hadn’t yet come to terms with such matters as parking arrangements in Turkey :- You get somewhere close to the town centre, find a small scrap of land signed “Otopark”, pay the guardian around 5TL, give him the car key and let him shuffle all the cars entering and leaving this area to enable the maximum number of cars to be parked there – hoping yours won’t be scratched when you get back! One problem was finding the centre - signage in Turkish towns wasn’t of the best even if one understood it and we hadn’t yet realised that “şehir merkezi” wasn’t the name of a district, but meant “Town Centre”! Yet we managed to see most of the elements in the time we gave it. The nomination makes much of the fact that the site relates solely to those aspects of Bursa arising from its the early development by the Ottomans (“The Birth of the Ottoman Empire”) after its capture from the Byzantines in 1324 by Orhan Ghazi, son of the founder Osman I (after whom the dynasty was named). He became Sultan in 1326 and the 4 subsequent Sultans take us through to 1421 when Murad II abdicated in favour of his son Mehmed II – i.e a period of almost 100 years after the accession of Orhan. During this period Ottoman Architecture developed from its Seljuk roots and incorporated e.g Byzantine ideas. Thus the “Bursa Period” is a recognised term in the study of Ottoman architecture. The buildings on show in Bursa were largely constructed at the end of this period and therefore reflect the developments made. b. 4 other “Külliyes”, each is named after a Sultan who built it and (usually?? We didn’t see them all) the Mausoleum of him and his family – So Murad I, Murad II, Bayezid I and Mehmed I. (That of Murad I is divided into 2 core locations because the Bath house is separate). The Kulliyes of Mehmed I in the area of Yesil (= “green”) is walkable from the Khans area and is perhaps the most significant one. Bayazid I is around 3kms further east. 2 more Kulliyes are situated to the West – those of Murad I and II – the former is the furthest out, situated in the suburb of Cekirge, around 7 kms from the centre. We visited 4 of the 6 separate geographical areas – the Khan area, Cumulakzik village and 2 of the Kulliyes - that of Mehmed I on the basis that it was walkable from the Khan area and seemed the most important architecturally, and that of Murad I which happened to be near our Bursa hotel.! a. The Khans area contains 2 mosques and 7 or 8 Khans, It is the bustling heart of the city fronted by a park with fountains and looking out on Ataturk Cadesi. All of the buildings seem to have been rebuilt over the years but the Ulu Camii or Great Mosque is a fine structure dating originally from 1399 - apparently it is particularly famed for the many examples of calligraphy on walls, columns and large plates erected for the purpose. The bazaar areas bustled as everywhere and seemed as big as those of Istanbul and (once upon a time) Aleppo. b. The Mehmed I Kulliye in Yesil is famed for the Green Mosque and the Green Tomb (the Mausoleum of Mehmed I). These also were rebuilt after the 1855 earthquake – whether that is the reason that the majority of the tiles are blue rather than green I know not! Inside the “Turbe” are the tombs we would get to know so well across Turkey – one large tomb surrounded by a number of smaller ones. Each tomb is covered with a cloth, either plain or with heavy calligraphy, and has a turban in cloth and or stone at the head – an idea we had seen last in saints’ tombs in Pakistan and I wonder if it is a tradition transplanted from Central Asia. As a reminder that these were Ottoman Sultans a large Turkish flag was nearby. One of the complaints ICOMOS had about the Kulliyes, is that many of the original buildings such as kitchens are no longer in place and I also felt that none of the 3 we saw were fully presented as social “complexes” in all their elements including the workaday - but perhaps all this is self evident to Turks visiting the sites - which now had UNESCO signage in Turkish and English, by the way. This one has a mosque, a tomb, a madrasah (now a museum and closed when we were there) and apparently a kitchen - but we never saw that. c. The Murad I Kulliye. This dates from 1426 and I can’t really say that we gained any further value from seeing this. Again there were a number of buildings in a complex but after seeing the Mosque and the tombs that was about it – the Madrasah and Kitchens are still in use as a community centre apparently. d. Cumalikizik. The inclusion of this village seemed particularly to upset ICOMOS and, in their recommendations, they asked for its inclusion to be “reconsidered”! The Turkish argument for its inclusion is that this and other villages were set up immediately after the conquest of Bursa and that Turkmen, who had assisted the conquest, were settled in them. They were “Waqf villages” meaning “that (they) belonged forever to a public institution (Complex) and served as a source of income for building the Complexes and the new town. (Their) creation was part of the founding of Bursa as a capital” (Nomin file). A bit tenuous? Whatever - the village is an attractive destination and was busy with Turkish and Arabic speaking tourists when we were there. The village is quite well signed to the north of the main East/West thoroughfare and the road climbs towards the mountains. Cars have to be left at an Otopark as the village itself is pedestrianised, other than to locals. Restoration of buildings was still ongoing as of May 2015 and the village was gradually being turned into a typical “tourist village” of souvenir shops and restaurants with some Pensions and no doubt some summer houses for the wealthy of Bursa. For the moment farming locals still drive their tractors through the streets. 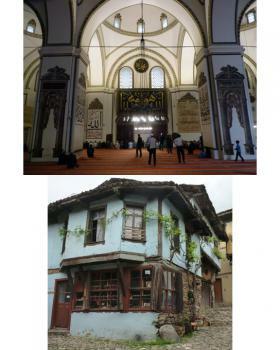 The following day we were to drive to Safranbolu, inscribed for its “Ottoman houses” but, whilst the architecture of both is “Ottoman” with its overhanging wooden superstructures etc, they are otherwise very different. Cumalikizik is basically a rural/ agricultural village whilst Safranbolu is very much a town with quite grand houses, Mosques, a Khan and other public buildings etc in its own right. So, having seen our 4 areas, do we think that ICOMOS was right to propose a deferral? Well – if you read the arguments I suppose that “intellectually” they hold water. Bursa perhaps could indeed have been better presented as an Ottoman “continuity city” through to the 19th C. And perhaps some of those Kulliye don’t really add a great deal, and that village does sit somewhat uncomfortably with the city elements. But, when one sees the ease with which yet another European Vineyard site gains inscription after ticking all the right boxes in its Nomination, one has to question whether the scheme as interpreted by ICOMOS is missing the wood for the trees. Bursa is a fine city, the early years of the Ottoman Empire with their architecture and social institutions are historically important and should be represented. Does it really matter what the detail of the Nomination File says? I am with the WHC on this one!! 2 months after it's inscription to World Heritage List Bursa hasn't experienced yet big tourists masses. Actually I didn't meet any other western tourists than myself but many Arab tourists have found this city and it's bazaars. Also locals were really interested to start a conversation with me which also shows that Bursa hasn't been found by tourists. Also Bursa doesn't seem to be yet proud of it's World Heritage status as I didn't see any signs saying that I'm in a World Heritage city. In some brochures there were mentions that sites in Bursa were on tentative list so I guess they're waiting for update. But all the sites I visited were in perfect clean condition which shows that inscription didn't come as a surprise for the city. Funniest thing is that Bursa is supposed to show the birth of Ottoman empire but actually only few of the sites are in original condition. Many of them have been destroyed once or twice in earthquakes and renovated in later styles. We started our visit at Bursa Citadel. You can find from there tombs of sultans Osman and Orhan. Osman was the first sultan of Ottoman empire and Orhan was his son. Tombs are really decorated and beautiful inside and represent late Ottoman baroque style as the original ones got destroyed in 1855. Next to the tombs is fine clock tower, the last one left in the city. Next we explored the Grand Mosque or Ulu Cami. Ulu Cami is definitely one the most beautiful mosques I have ever visited. The fountain in the center and the glass roof give it a special character and the Arabic calligraphy on the walls is superb. The mosque represents the older Seljuk style and that's why stands out from rest of the mosques. After the mosques we explored the bazaars and khans around the mosque. My favorite was Koza Han with beautiful courtyard hosting a small mosque. From the center we moved to Yesil Camii, Green Mosque in English. This mosque represents the pure Ottoman style with upside-down-T plan. As Blue Mosque, the Green Mosque got it's name from it's green interior. Next to the mosque is Green Tomb where sultan Mehmed I is resting with his family members. The tomb looks green from a far but close by you notice it's actually blue. The interior is nicely pink. 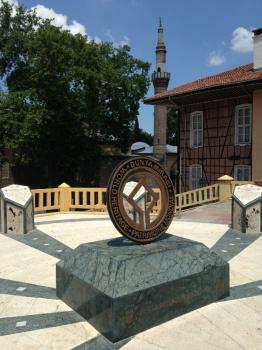 Next on our program was Emir Sultan Camii, little bit further away from Yesil Camii. Emir Sultan is made from wood and surrounded by green cemetary so it's atmosphere is very peaceful. I got to have a chat with imam who was surprised to see a tourist in the mosque who was not a muslim. Unfortunately this mosque is not included in the World Heritage inscription maybe because it was heavily restored in 1990s. It represents Ottoman rococo style. From Emir Sultan we walked to Yildirim Beyazit Camii, our last mosque for the day. As we had already seen many Ottoman mosques that day there was nothing new for us anymore. We enjoyed watching the sunset from it's yard. Next day we visited in Muradiye complex. 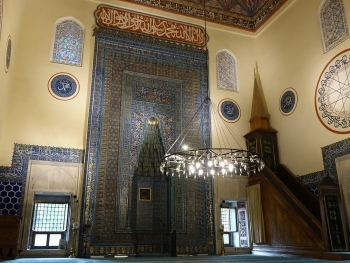 The Muradiye Camii was again the basic Ottoman style. Around the mosque is 12 tombs but they were at the moment being renovated and it was not possible to walk in the park. The parts we didn't visit of the World Heritage site were Murat I Hüdavendigar Camii and Cumalikizik which are more out of town. Bursa's mosques were in size much smaller than the grand mosques in Istanbul and Edirne and represent totally different style so I think this was worthy addition to the World Heritage List. You can see the central sites in the city in one day but I would suggest to give 2 or 3 days for Bursa to fully explore it and it's surroundings, for example the mighty Uludag mountain and taste the amazing Iskender kebap and sugared chestnuts. 3.0: Svein Heltberg Alexander Parsons Nan Ian Cade Tony H.
From Istanbul, take the BUDO ferry from near the Galata Bridge. Arriving at the other side of the Sea of Marmara in Mudanya, take yellow bus F3 for a direct ride into Bursa city center. Ibn Battuta: "We went on next day to the city of Bursa, a great and important city with fine bazaars and wide streets, surrounded on all sides by gardens and running springs"